Nanda Devi with 7,816 meters of height is the wonderful trek for every trekker from different parts of the world. After the closure of the Nanda Devi Inner Sanctuary region, the Nanda Devi East Base Camp Trek became the only way through which trekkers can witness the beauty of the twin peaks - Nanda Devi and Nanda Devi East. Though the first attempt to climb Nanda Devi was a failure, it was done in the year 1930 and again in the year 1934. Later in 1936 a British team with three Sherpa climbed the mountain successfully and was followed by several other trekkers in the succeeding years. 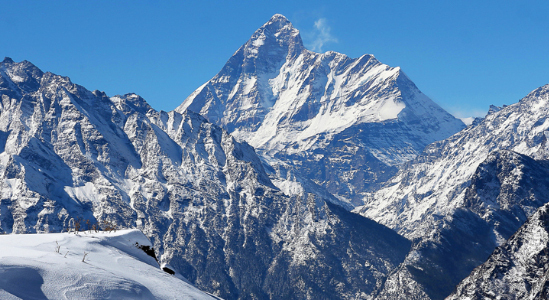 The two massif peak of Nanda Devi is the highest mountains in the Gharwal Himalayas. The region has been considered having the most beautiful land in the mountain ranges. For Indians, Nanda Devi is a blessed mountain, the name of which can be translated as Follow: “Nanda” is one of the nick name of the goddess of death, the wife of Shiva. “Devi” means Goddess. Trekking to East Nanda Devi Base Camp is always in the bucket list of all the adventure lovers, the second highest peak in Indian Himalaya. 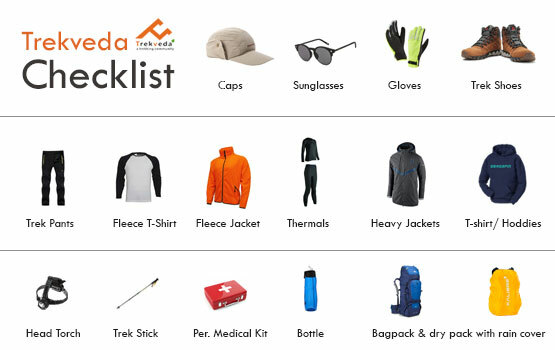 Nanda Devi trek is on the heights but with a moderate climbing and the passionate trekkers can never deny planning a trip to Nanda Devi East Base Camp. This alluring trek with the view of admirable Nanda Devi Peak, which happens to be one of the most stunning in the world, the trek to the east base camp is an unmatched experience. 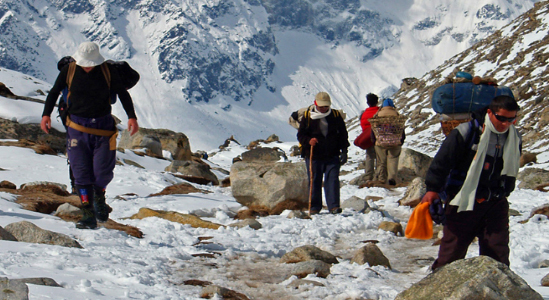 Nanda Devi base camp is spiritual as well as is an adventurous trek one can plan and add in their bucket list. After our arrival in Kathgodam, we will drive towards Munsiyari through the beautiful hills of Kumaon district. It takes around 9 hours to reach Munsiyari which is 280km away from Kathgodam. Overnight stay in guest house. Today we will start our first day trek from Munsiyari to Lilam, we will pass through Darkot and from there the trek is descent until we reach the river Jimighat. From here we will ascent back to Lilam. Overnight stay in tent with dinner. On the third day we will ascent towards Bogudiar from Lilam, where throughout the way we will encounter the thick forests of utees after reaching Bogudiar we must witness shepherds with their Flocks of sheep and the attractive meadows. Dinner and Overnight stay in tent in Bogudiar. We continue trekking from Bogudiar to Rilkot from here the Trans Himalayan trek begins; this beautiful trial passes through the gorgeous stretched grassland, Dinner and overnight stay in tent. On the 5th day we will start trekking from Rilkot, after trekking for some time we will reach Martoli peak from where the trans Himalayan view gives a panoramic effect, continue trekking until we reach Ghanghar village where you can experience the culture of mountains and more. Dinner and Overnight stay in tent. Trekking towards Pachu Glacier on the way we witness the Rhododendron trees, where the peak of the Pachu Glacier seems so near after some time of trekking we will reach the destination and discover the Pachu Glacier on the Northern face of Nanda Devi, Dinner and Overnight stay in tent. Explore the Nanda devi base camp witness the beautiful sunrise at the Nanda Devi Peak; get a clear view of Glacier. You will descent for some time, Martoli village have some ancient roots that’s why on the way you will witness many houses with wood carving, this village is also very famous for getting a astonish view of Nanda Devi Peak and Nanda Kot. This morning we will trek back to Rargari from Martoli, overnight stay in tent and dinner. On this morning we will drive back to Munsiyari from Rargri where we will take a overnight stay and dinner. It’s the finally day to return back to where we came from because the trekking journey ends here, we will drive back to Kathgodam from Munsiyari. The trek expense of Rs. 35,500 + 5% GST takes care of all expenses of the trek from Munsiyari to Munsiyari. Backpack offloading charges - If you wish to offload your backpack, there will be an additional charge of Rs. 5400 + 5% GST. The backpack cannot weigh more than 9 kgs. Suitcases/strollers/duffel bags will not be allowed. Please note that charges will vary for last minute offloading in case you decide to offload your bag after reaching the basecamp (Rs. 5,850 + 5% GST). Online offloading in advance is possible up to two days prior to the trek start date. Buffer day – It is mandatory to have this extra day as any bad weather or rain will delay your pass crossing. If buffer day is utilized, you will need to pay Rs. 4,000 + 5% GST. This amount is to be handed over to your trek leader.